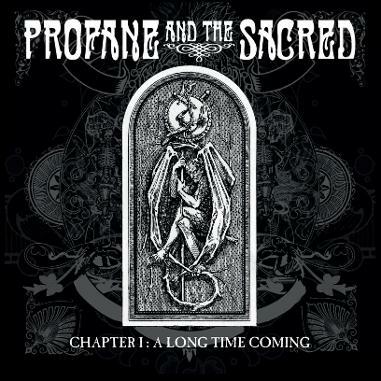 London based Profane And The Sacred have just release their much anticipated debut album ‘Chapter I : A Long Time Coming’. Luke Alleeson (Vocals and guitar), Rick Spooner (Guitar), Rob Taylor (Bass) and Kieran Smith (Drums) have produced an excellent debut album that encompasses their live sound, and is full doom-laden guitars that produce monster riffs with a heavy stoner influence, as well as gritty vocals that are a powerful addition to the massive sounding tracks on the album. This is 9 tracks that will blow you away from the very first listen and ‘Chapter I : A Long Time Coming’ has to be one of the albums to have for 2015. The delicate opening of ‘Bench’ masks the powerful sound that the band have, as the massive sounding riffs and rhythm crash into the rest of the album and doesn’t stop until the very last note. Even the final track ‘A New Leaf’ with its softer intro, still has an intensity to it as the song rises into a immense wall of sound. With a range of influences throughout each track, it offers something different on each song and this is an album that is going to be hard to stop playing once you start. Profane And The Sacred have also just released a new lyric video for their second single from the album, ‘Words’ which gives a teaser of just how brilliant the rest of the album sounds.